by Chris Woodford. Last updated: February 16, 2019. We can't all be racing drivers or astronauts. Not everyone can dive to the bottom of the sea or climb up Mount Everest. But we can all go on rollercoasters and see what it feels like to push ourselves to the limit. You might think rollercoasters are all about testing your body, but your mind's being worked out too: the mental psychology of fear makes the whole physical experience so much more exciting. Let's take a closer look at the science of extreme rides! Photo: Rollercoasters turn physics into fun! 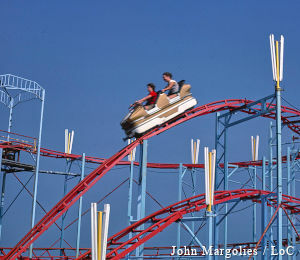 Photo of a ride in Atlantic City, New Jersey, by John Margolies, courtesy of John Margolies Roadside America photograph archive (1972–2008), Library of Congress, Prints and Photographs Division. Have you ever wondered why rollercoaster cars don't have engines? Vehicles don't always need that kind of power to make them go. But they do need energy of some sort. Before a rollercoaster ride begins, an electric winch winds the cars to the top of the first hill. That can take a while, because some rollercoasters start off nearly 100m (330ft) in the air! The winch has to use energy to pull the rollercoasters up the hill, but that energy doesn't simply disappear. The rollercoaster cars store it just by being up in the air—and the higher up they are, the more energy they store. They'll use the same energy to race back down the hill when the ride begins. Because they have the ability (or potential) to use in the future energy that was stored in the past, we call the energy they're storing potential energy. Photo: What comes down must go up! The kinetic energy that makes a rollercoaster car move at speed comes from the potential energy the car gained when it was hauled to the top of the very first hill on the ride. 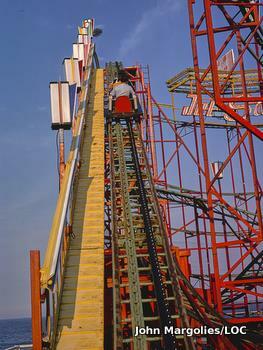 Photo of the Jet Star roller coaster, Seaside Heights, New Jersey by John Margolies, courtesy of John Margolies Roadside America photograph archive (1972–2008), Library of Congress, Prints and Photographs Division. Once everyone's onboard, the cars are released and start to roll down. When they round the brow of the first hill, the force of gravity makes them hurtle downwards, so they accelerate (pick up more and more speed). As they accelerate, their potential energy turns into kinetic energy (the energy things have because they are moving). The further they go down the hill, the faster they go, and the more of their original potential energy is converted into kinetic energy. At the start of the ride, the cars have a certain amount of potential energy. They can never have any more energy than this, no matter how long the ride lasts. Throughout the ride, they are constantly swapping back and forth between potential and kinetic energy. Each time they race up a hill, they gain more potential energy (by rising higher in the air), but they compensate for it by losing some kinetic energy too (by slowing down). That's why rollercoaster cars always go slower in the higher bits of a ride and faster in the lower bits. In theory, this process could go on forever and the ride would never end. But in practice, some of the potential energy the cars started off with is constantly being used up by friction, when the wheels rub against the track. Air resistance takes away more of the energy as well. Even the rattling noise the rollercoaster makes uses up some of its energy. The cars lose more and more of their original energy the longer the ride continues, and, since the cars have no engines, there's no way of replacing it. That's why the loops on a rollercoaster ride always get smaller and smaller. It's why rollercoaster rides must always come to an end sooner or later. The cars simply run out of energy. Artwork: How energy and forces change during a rollercoaster ride. To learn more about centripetal force—the force that makes things go around in a circle—please take a look at our article on centrifuges. If rollercoaster cars still have energy to spare when they reach the end of the ride, they can be rapidly brought to a halt with brakes. There isn't a driver onboard to apply ordinary hydraulic brakes, so the brakes need to be completely automatic. On older rollercoasters, there's usually some kind of a friction brake on the track that stops the train as it tries to slide over it. Modern rollercoasters have different (and usually more reliable) eddy-current brakes, which use magnets to generate a braking force as the train goes past. 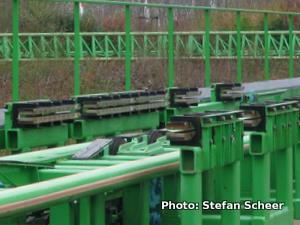 Photo: Eddy-current brakes (black) mounted on the side of a roller coaster track (green). Photo by Stefan Scheer courtesy of Wikimedia Commons published under a Creative Commons Licence. Energy is what makes a rollercoaster ride last, but forces are what makes it so thrilling. You can't see the forces pushing and pulling your body as you race round the track. But it's forces that knock you backwards. It's forces that make you feel as light as air one minute and as heavy as a rock the next. It's also forces that keep you safely in your seat when you're suddenly spinning upside down. Wherever you are in the ride, lots of different forces are always acting on your body. The biggest force you feel is your weight—and the weight of the cars and the other people on the ride. All that weight doesn't simply pull you straight down. It pulls you forward when you race down a hill and backward when you climb. There are other forces at work too. Air resistance pushes against your face and limbs. There's also a frictional force between the cars and the track. And because you push down on the seat with your body, it pushes back up on you. All these forces acting on you are never quite in balance—that's why you zoom down the track, why the car rattles, and why you shake about so much. 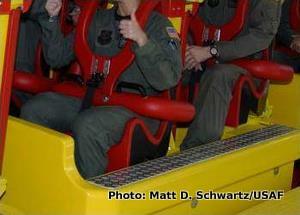 Photo: You have to wear a safety harness to keep you in your seat because the forces on rollercoaster rides are so extreme. But that's all part of the fun. According to Isaac Newton's third law of motion, when you press against the seat restraints, they press back on your body. All those forces pushing you one way and the other only add to the enjoyment! Photo by Matt D. Schwartz courtesy of US Air Force. From moment to moment, the forces you feel are never the same—and that's why the ride is so unpredictable and exciting. When you do a loop-the-loop, the direction you're moving in is always shifting. That means the forces you feel are also changing from one second to the next. Coming into the loop, you barely feel any force at all. As you start to climb, you feel an enormous force dragging you backward. The force gets stronger and stronger. At the top of the loop, you feel like you're going to fall out of your seat. Then the force gradually gets weaker again as you come back round to the straight. How big are the forces on a rollercoaster? The forces you feel also depend on whereabouts in the train of cars you're sitting. If there are lots of cars and the train is quite long, different cars can be at different points on the ride. The front cars may be racing down a hill while the back cars are still climbing up behind them. All the cars are coupled together, so the front cars pull the back ones along at the same speed. But the forces on people sitting in different cars can be quite different. When the front car goes over a hill, it's barely even moving. Sometimes it goes so slowly you wonder if it'll even get to the top. Then, as it starts racing down the hill, it pulls the other cars along behind it. When the back car starts climbing a few seconds later, it's whipped over the top really quickly—and you almost fly out of your seat. As the back car races over the hill, you feel weightless for a second or two. That's why, for sheer exhilaration, the back car is often the best one to sit in. If you like a good view, though, sit at the front! 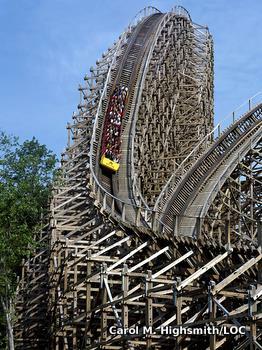 Photo: Many people think classic wooden rollercoasters are the best. This is the record-breaking Son of Beast ride at King's Island amusement park, Mason, Ohio. It might look like something from the last century, but it was opened only in 2000 (finally closing in 2012). Photo by Carol M. Highsmith, courtesy of Carol M. Highsmith Archive, Library of Congress, Prints and Photographs Division. If rollercoasters remind you of sledges, that's not surprising. The first rollercoasters were built during winter in Russia in the 14th and 15th centuries. They were huge blocks of ice with holes carved out of them, lined with fur and straw to make seats. The blocks slid along a wooden framework sprayed with water to make it really icy too. Today's rollercoasters are mostly made from metal, with enough steel girders in a typical rollercoaster to make around 10,000 cars. All that metal makes an incredibly sturdy structure: the cars can go faster and have tighter curves and higher loops and still travel in perfect safety. The cars are made from steel as well as the track and, unlike their icy Russian predecessors, they're more like trains than sledges. They have two sets of wheels that run both above and below the tracks (that's how they stay on the rails when they're going upside down). Some very modern rollercoaster rides are still built out of wood and, though you might think that's not so safe, it's a perfectly designed part of the fun: the idea is that the tracks rattle, shake, and groan to make you feel more afraid! The science of risk: are rollercoasters safe? Photo: Rollercoasters make our brains feel terrified while keeping our bodies safe. 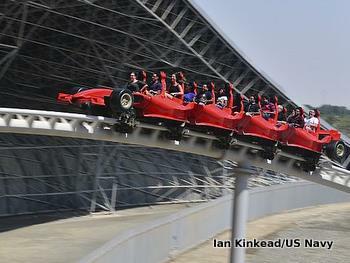 Photo of Ferrari World in Dubai by Ian Kinkead courtesy of US Navy. Anywhere else, all those screams and yells might give cause for concern. But in an amusement park, it's what we expect. A rollercoaster that didn't make you scream wouldn't be worth the ride. You'd feel short-changed; you might even demand your money back! But the perfect rollercoaster has to fool our minds into thinking they're in imminent danger while keeping our bodies safe at all times. When accidents happen on rollercoaster rides, people are understandably upset and concerned. Amusement rides are places where families go to enjoy themselves, not to meet real-life horror and disaster. Rollercoasters are cleverly designed to maximize fear; they're as much about human psychology as the physics of energy conversion. But psychology can and does play tricks. We love rollercoasters because they feel more dangerous than they actually are. But when an accident happens at an amusement park, the newspaper and TV coverage persuades us that rides like this really are dangerous. The psychology that attracts us to rollercoasters works in reverse—and makes us stay at home! So how safe are rollercoasters, really? It's no more sensible to answer that than to answer "How safe is crossing the street?" It depends on the street, how you cross it, and when you do so. Researching this topic, I found an online news item suggesting that the risk of having an accident on a rollercoaster is greater than that of being attacked by a shark. Most people, living and working in cities, are at zero risk of being attacked by sharks, so what does that comparison tell us? Not very much. Instead of helping us figure out whether the risk is one we feel comfortable taking, it plays another sly trick with psychology: it compares one thing (instinctively perceived to be dangerous by most people—sharks) with another (about which we instinctively have no reliable information—rollercoasters). It's easy to list all the accidents and fatalities that have ever happened at amusement parks and conclude that rollercoasters are "dangerous." But how dangerous are they compared to everyday risks that we happily endure? The news report comparing rollercoasters to sharks went on to say "The number of rollercoaster deaths are also relatively high." But relative to what? Relative to reading a book or relative to parachute jumping? According to a 10-year scientific study of rollercoaster accidents (Roller coaster related fatalities, United States, 1994–2004 by A.R. Pelletier and J. Gilchrist, published 2005), "approximately four deaths annually are associated with roller coasters." Compare that with the number of deaths annually from all forms of accidental injury (130,557), falls (30,208), motor vehicle accidents (33,804), and accidental poisoning (38,851) [Source: Accidents or Unintentional Injuries, Center for Disease Control and Prevention, 2013.] It's not an exact comparison (far more people routinely use cars than ride rollercoasters, so we'd expect the number of deaths to be greater), but at least it's a meaningful comparison: we all have a pretty good idea how safe cars are, for most people, most of the time. Perhaps even more telling than this, only about a quarter (28 percent) of the people who died on rollercoasters (listed in that study) were killed by traumatic injuries from the rides themselves. The study found that "approximately half of deaths associated with rollercoasters occur from medical conditions in people without external signs of injury." In other words, they're people who have suffered things like brain hemorrhages or had heart attacks that might well have killed them in other circumstances (about a third of those people were already aware of their own medical conditions). 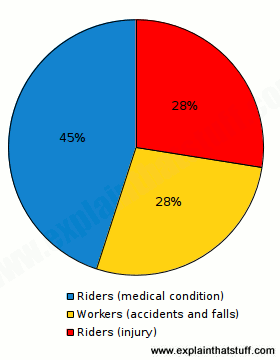 The remainder were ride workers killed by health and safety failures. There are millions more people riding rollercoasters than operating them, but the relative number of deaths is 2:1. Logically, then, you should be more concerned about the safety of rollercoasters if you work with them every day than if you simply ride them from time to time, but even here the absolute risk is fairly small: rollercoaster operators are not dying in their hundreds and thousands. The lesson here is a scientific one. When people ask "Is something safe? ", think hard about what that really means. What do we mean by safe? Safe for whom? How does the meaningfully measured risk compare with comparable, everyday risks? What does the evidence tell us when we look more closely? Don't take sensational media reports at face value: think about the science, crank the numbers, and see for yourself. How to understand risk in 13 clicks by Michael Blastland, BBC News, March 11, 2009. This simple article explains how sensational media coverage can exaggerate real, everyday risks. The Norm Chronicles: Stories and numbers about danger by David Spiegelhalter and Michael Blastland. Profile Books, 2013. This excellent, very readable book expands on the everyday mathematics of risk. The Wildest Roller Coasters of 2018 by Mekado Murphy, The New York Times, July 25, 2018. A look at four of the most exciting rides in the United States today. Thrills and chills by Eric Minton, Psychology Today, May 1, 1999. How does psychology play a part in making roller coasters more exciting? These are generally aimed at ages 9–12. Roller Coasters: From Concept to Consumer by Kevin Cunnigham. Scholastic, 2013. A careers guide that explores what it's like to be a roller coaster designer or engineer. The World's Wildest Roller Coasters by Michael Burgan. Capstone Press, 2001. How do roller coasters actually work? This 48-page book briefly covers the science as well as the history of wooden and metal coasters. Energy by Chris Woodford. Dorling Kindersley, 2007. Another one of my books. This one explores exactly what "energy" means. Where does it come from and how does it power everything in our world? Force and Motion by Peter Lafferty. Dorling Kindersley, 2000. One of the superb DK Eyewitness books, with science, technology, and history explored side by side. Ticket To Ride: The Essential Guide to the World's Greatest Roller Coasters and Thrill Rides by Patrick Hook. Chartwell, 2019. A guide to the history and evolution of white-knuckle rides. America's Top Roller Coasters & Amusement Parks: (A Guide for Those Who Ride Them and Tips for Those Who Fear Them) by Pete Trabucco. Tate Publishing, 2009. Very much a guidebook to rollercoasters in the United States.